We had a number of development style questions during our last open call for science chat questions, and as such, weren’t able to prioritize those during our last busy chat. We still wanted to get these answered for everyone, so here they are. Most of the heavy-weight processing is done inside of Rosetta, so if and when it is added, we can consider it. Aside from the technical problems, this also introduces potential social problems. If the benefits of using these platforms are meaningful, it could make a high end graphics card a requirement for competing. While this is also true for CPUs, CPU performance is not as varied or expensive compared to GPUs. We don't want a situation where your ability to compete is determined by your graphics card. Unfortunately, this is unlikely. Please note that Rosetta itself is not open source, either. In this case, rebuild is not actually inserting a fragment at all. It just places a cut, and then does a loop closure to close it again. Are they the same internally? Or what would be the equivalent LUA function for this GUI one? 22:11 TomTaylor5 What would you like to hear first? The good news or the bad news? 22:11 TomTaylor5 That was probably the function I couldn't find. They are using the same underlying procedure, but they differ in how they call it. The GUI script weirdly wiggles the residues sequentially, one at a time. Thanks for the questions, everyone! We hope these additional answers help. This an excellent question, but unfortunately it does not have a simple answer. The folding pathway—sometimes discussed as "folding kinetics"—describes how an unfolded protein transitions to its native fold over the course of time. In general, folding pathways are poorly understood, but it is an area of active research (in fact, our very own David Baker started off studying the kinetics of protein folding in the '90s!). Most of us working with Foldit or Rosetta do not think much about folding pathways (as one colleague put it, "Who cares?"). We lean heavily on the assumption that a chain of amino acids will naturally adopt its lowest-energy structure (see Anfinsen's dogma), and we don't worry too much about the path required to get there. In other words, we're more interested in how a protein system behaves at equilibrium; exactly how the system reaches equilibrium is another matter. Coincidentally, I am not an expert in folding kinetics, but I can touch on the main points. Most people agree that strong, local interactions will form first (e.g. the short-range hydrogen bonds that stabilize α-helices and β-hairpins); and weak, nonlocal interactions will form more slowly (e.g. β-strand pairings between distant residues, interactions between pre-folded domains, etc.). Many small proteins seem to fold via a concerted, two-state mechanism. You might imagine that such a protein is translated completely by the ribosome, and exists briefly as a random coil in solution before collapsing all-at-once into a stable fold. We observe such proteins in only two states: either completely unfolded or completely folded. This is the most likely scenario for the types of small proteins (<150 residues) that are encountered in Foldit puzzles. Larger proteins seem to follow more complex, multi-state folding pathways. In some cases, we can actually observe multiple populations of a protein that exists in various, discrete stages of “foldedness.” Many of these proteins even fold co-translationally in the cell, so that the N-terminus of the protein might be completely folded before the ribosome finishes translating the C-terminus. 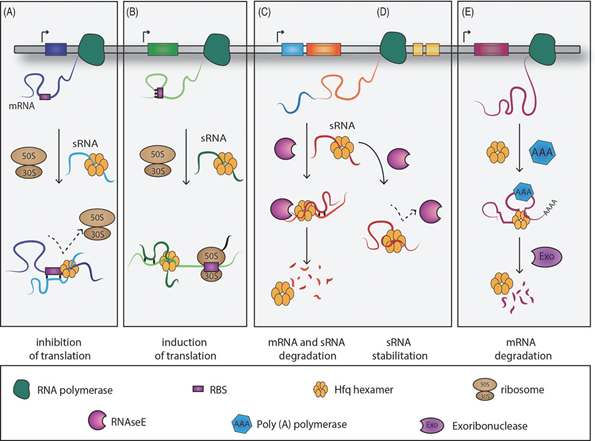 In fact, there is evidence that certain genes have evolved “brake” regions in their mRNA, which actually slow down the ribosome at certain points during translation so that the N-terminus has a chance to fold before the C-terminus is translated. If you want to know more (and we hope you do), I strongly recommend this review article by Dill et al. It is a clearly-written overview intended for readers outside of the field. And, like any good review, it includes many pages of references for more curious readers. There are two motivations behind the Blueprint tool: The first is simply to make “ideal loops” more accessible to players. The Ideal Loop Filter has helped Foldit designs tremendously, and the recent top-scoring designs have all had excellent loops. However, it seemed that players were required to do a lot of work in order to satisfy that filter. Hopefully, the Blueprint tool has made it easier (especially for beginners) to satisfy the Ideal Loop Filter. The second motivation for developing the Blueprint tool is to provide an alternative design process. Some of us suspect that bad Foldit backbones are the result of aggressive loop building in middle- or late-game strategies. 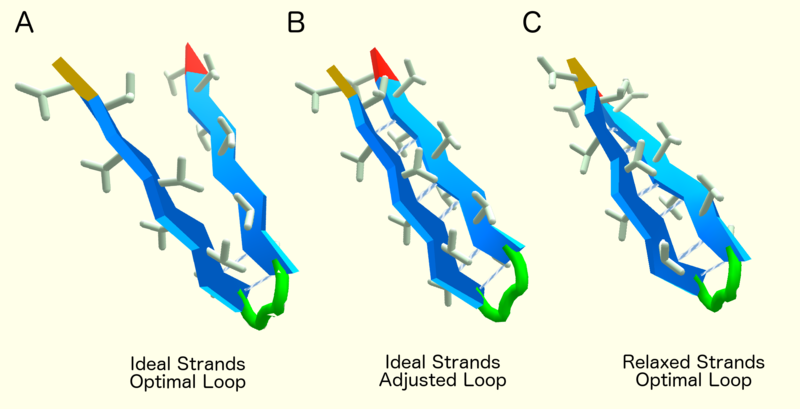 For example, suppose you're designing a protein and decide to form the loops last: by the time you build loops, you may have already cemented your helices and sheets into place and optimized the core packing of your protein, and as a result the backbone does not have a lot flexibility for rebuilding loops. The endpoints of two neighboring beta strands may be positioned such that there is no stable loop to bridge them. Aggressively using Rebuild/Remix to force a loop between incompatible endpoints is akin to hammering a square peg into a round hole. It will be impossible to close the loop without compromising the geometry of the backbone. We had hoped the Blueprint tool could be used early in the design process to quickly construct a "healthy" rough draft of a design, which could be gradually optimized without compromising the backbone geometry. To answer gitwut's question, BuildingBlocks include torsion constraints. Torsion constraints force a residue to a certain region of the Ramachandran Map—much like Rubber Bands (which represent distance constraints) force two residues to be a certain distance from one another. When constraints are present, Wiggling a solution will not produce points as quickly, but the solution will try to follow the constraints. Broadly speaking, constraints allow us to redirect Wiggle toward a desired result, usually sacrificing short-term gains to find an ultimately better model. Placing a BuildingBlock loop onto the Blueprint Panel introduces torsion constraints to the loop residues (likewise, removing the BuildingBlock removes the constraints). The torsion constraints are intended to preserve the BuildingBlock loop while a player develops the rest of his or her design. Constraints are needed in this case because the Foldit energy function does not necessarily favor the BuildingBlock loops. In fact, we don't fully understand why the BuildingBlock loops are so prevalent in natural proteins. These loops may be favored for reasons that are not explicitly modeled in Foldit—like folding kinetics, or more complex entropic effects. (In contrast, helices and sheets are naturally stabilized by hydrogen bond forces, which are captured by the Foldit energy function.) Without the torsion constraints, Wiggle is prone to obliterate the BuildingBlock loop in favor of more short-sighted energy gains. We intended that players might keep the constraints around to preserve the BuildingBlock loops until a design-in-progress has settled into a mature fold—only then removing the constraints for late-game refinement. To make things even more complicated, note that we've manually adjusted how BuildingBlocks are applied through the Blueprint Panel. That is, when you drag a BuildingBlock onto the Blueprint Panel and the protein backbone snaps into place, this initial "adjusted" form is only a rough approximation of the loop's optimal form. When you Wiggle the loop, the torsion constraints will drag the backbone to its optimal shape, which may be slightly different from initial adjusted shape (this is particularly noticeable for β-hairpins BuildingBlocks). This is because the BuildingBlock loops are derived from native proteins, which never have perfectly ideal helices and sheets. If you were to apply the optimal BuildingBlock loops to Foldit's ideal beta strands, the ideal beta strands would not align to form hydrogen bonds (Figure A, above). In order to make the tool more user-friendly, we adjusted the optimal BuildingBlocks so that the hairpin loops would be compatible with Foldit's ideal sheets. Thus, a BuildingBlock hairpin will initially snap two ideal strands into perfect alignment (Figure B); and subsequent Wiggling will allow the beta strands to flex slightly, so that the BuildingBlock loop can relax into its optimal form (Figure C). As an aside, some astute Foldit players have noticed that the BuildingBlocks collection is missing a BAAB β-hairpin, which is a stable loop frequently found in nature. As it turns out, this loop induces significant deformation of the adjacent beta strands. As much as we tried, we were unable to adjust the BAAB BuildingBlock so that it would be reasonably compatible with Foldit's ideal beta strands, and that particular loop was omitted from the BuildingBlocks collection. Tuberculosis (TB) is a disease that affects millions of people. We have posted a protein drug target puzzle previously on this topic. In our continued effort to make a dent in this disease, we have also partnered with the Sacchettini lab at Texas A&M University to post another drug target puzzle for TB. To carry out their missions, small RNAs require protective chaperon protein – Hfq. Specifically, the protein structure adopts an Sm like fold composed of 6 subunits forming a homo-hexameric ring. Hfq and Sm proteins have been identified in numerous bacteria, yet no known homologs have been annotated in Mycobacterium tuberculosis genome. Through careful examination of secondary structure patterns predictions of the Mycobacterium tuberculosis proteome, Rv3208A has been proposed as a possible Hfq candidate. If we were able to solve the structure, it would mean that we learn about machinery which has been shown to be important for virulence in other pathogens but is not characterized in Mycobacterium yet. By targeting this RNA chaperon protein, instrumental to any small RNA mediated responses, scientists can prevent Mycobacterium tuberculosis from survival inside human host. Right now, the protein has been crystallized and diffraction data are available, but none of the models that scientists have created have helped to solve the phase and build the structure. By posting this protein, we are hoping that everyone can come up with a model that will help resolve the structure. As always, we are committed to publishing the work and sharing models created by Foldit players. Lets make a dent in TB! This blog post introduces a new tool for Foldit protein design. The Blueprint Panel displays the amino acid sequence and secondary structure of your protein. By default, each letter of the sequence is colored according to the φ and ψ torsions at that position in the structure, following the same ABEGO coloring scheme used by the Rama Map. Above the sequence, a secondary structure diagram reflects the sheet and helix assignment at each position. The Auto Structures button will detect sheets and helices, and make the appropriate secondary structure assignments. The Blueprint panel is accompanied by the Building Blocks panel. Building blocks represent discrete patterns of protein backbone that can be applied to your protein structure. The building blocks provided here correspond to specific loops that are frequently observed in natural proteins (they were previously known as "Ideal Loops" in the Rama Map). All building blocks are meant to connect secondary structure elements directly, with a sheet or helix on either side. The appropriate use of a building block is dependent on this secondary structure "context." For example, a Helix-Sheet building block would make a good connection between a helix at position 20 and a sheet at position 23, but would not work well if the helix and sheet positions were reversed. Click-and-drag a building block onto the Blueprint panel to apply the building block to your structure. Applied building blocks will remain outlined in the Blueprint panel. Applied building blocks will continue to exert torsional constraints wherever they are placed—these constraints behave like rubber bands for φ and ψ torsions, and will try to keep residues close to the original building block shape whenever you use Wiggle. Click-and-drag a building block off of the Blueprint panel to remove the building block; this will also remove the associated torsional constraints. It is recommended that you leave building blocks and torsional constraints in place while you continue to fold a protein. 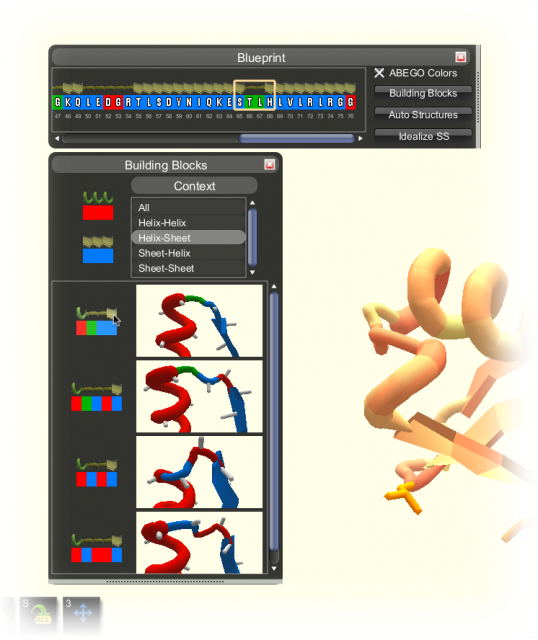 The Building Block panel includes two special building blocks next to the Context menu: one block is all-helix and another is all-sheet. These special building blocks can be placed on the Blueprint panel to shape residues into ideal helices and ideal sheets. They do not exert torsional constraints, and disappear immediately after they are applied. The Blueprint Panel will be enabled in specific design puzzles. It can be accessed from the Actions menu in the Original Interface, or from the Main menu in the Selection Interface. Try it out now in Puzzle 1305!